Forging(Hada): Forging is fine Itame mixing with flowing indication along Mune of Shinogi-ji surface. Hiraji surface is covered in sparkling Ji-nie glitter that generates darkish small Nie lines grain so called CHIKEI activity. Temper(Hamon): Hamon is rather on coarse side Nie hard metal granules base, Flamboyant Gunome, Togari-ha and Choji-shape outline where entire temper varies in shape and height. The interior of temper is filled with mist-like crystallize area deeply with ASHI and floating YOU activities, thick lines of Nie-SUNAGASHI and bright curved threadlike KINSEN areas. Deep sparkling Nie accumulates on the gorges of Gunome-outline and a pair of round head forms likely "eyes of horsefly" so called "Abunome". Some of Gunome splashes into Hiraji surface so called Tobiyaki. The entire temper gives off bright and vivid impression. Temper of tip(Boshi): Boshi forms almost Ichimai - strongly irregular indication with intense Hakikake brushing thick lines of Nie. Tang(Nakago): Nakago is a bit Machiokuri almost in UBU original. Two peg holes (one is filled). Kiri (horizontal) filemarks. Back ridge of Nakago is flat and Uneven U-shape (Ha- agari kurijiri) heel shape. The signature is located on the other side in Tachi-mei - Eleven character that starts from the place of work Hizen-koku 肥前国, an official district title Yamato-daijo 大和大掾, the name of clan Fujiwara 藤原 and the smith name KANEHIRO 兼廣. Among cadet branches of 1st TADAYOSHI family in Hizen,the most significant schools are YOSHISADA 吉貞 and HIROSADA 広貞 branches of two brothers by a different mother.They are very excelled in flamboyant Gunome Choji Hamon therefore both two branches had been loved most tenderly by the Nabeshima clan in generations. Two brothers played a ghost-maker to assist the 1st generation TADAYOSHI very capably,therefore their posthoumous works are quite rare. Many of their works were supposed that Suguha (straight) temper were signed as Hizen-koku TADAYOSHI 肥前国忠吉 or Musashi Daijo TADAHIRO 武蔵大掾忠広, sometimes as Oumi Daijo TADAHIRO 近江大掾忠広, whereas the other works with flamboyant Gunome Hamon were signed of there own. 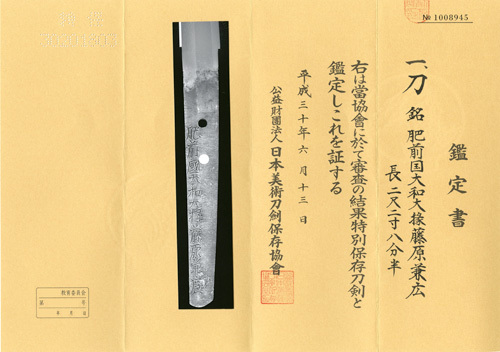 This Katana is full of vigor in highly harmonious manner of Hizen school with flamboyant temper of his proud.